What a great day out on the water! The sun was out and shining and the animals were definitely out enjoying the good weather. We had a lovely group of people get off the Washington state ferry and join Captain Pete, Naturalist Sarah and myself on the 12:00 trip. 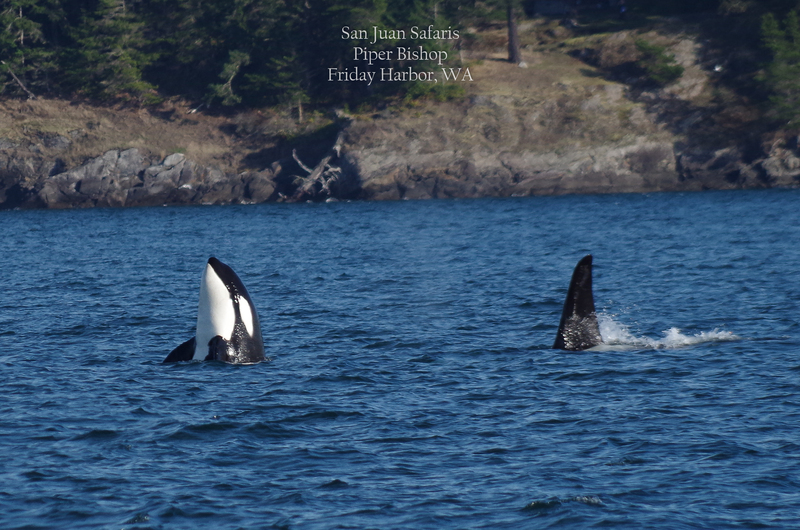 Starting out of Friday Harbor, we took the Sea Lion and journeyed up the East side of San Juan and set off to join the group of Bigg’s orca whales (the T77s) that were reported to be heading North along the West side of San Juan. Along the way we were lucky enough to sea a bald eagle perching high up in a tree along the shoreline. As we got near, he flew off over our heads! It was nice to see that 6-foot wing span in action. We ended up near Stuart Island and once we reached Turn Point – the most Northwestern point of the San Juan Islands – we found the T77s! Everyone was very excited to see this family group of 4 killer whales. We witnessed some hunting behavior as the matriarch of the group worked on teaching the younger whales of the family how to feed. The male in the group (the eldest brother) even showed us a backwards surfacing behavior which we call moonwalking! This indicates food sharing amongst the whales. Since Bigg’s killer whales only feed on marine mammals, the family was diving and searching for seals against the rocky shoreline and hidden coves. Because these whales are super stealthy animals, the transient whales tend to be as quiet as possible. This means minimal vocalizations and echolocation. Because of this, we witnessed a spyhop! We speculate that the matriarch popped her whole head and part of her body out of the water in order to scan her surroundings and make a hunting plan without making noises to give their location away. We were lucky enough to watch them swimming for a while along Stuart Island. Eventually it was time to head back but the animal sightings continued! As we headed back through John’s Pass we found a large group of seals basking in the sun and even some swimming in the waters! It’s always nice to watch our healthy population of seals up close and see the animals that our whales feed upon for the majority of their diet. The beauty and ecological wonders of the San Juan Islands never fail to amaze.